Volkswagen has unveiled the T-ROC concept at the Group’s pre-Geneva show, completing a series of concepts that preview an enlarged SUV range, which currently only has the Tiguan and Touareg. 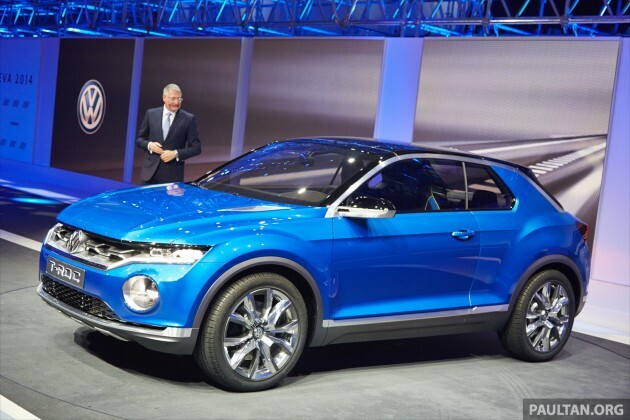 The T-ROC, a Golf-format concept (it sits on the Modular Transverse Matrix MQB platform) positioned a step down from the Tiguan, comes after the CrossBlue (Detroit 2013), CrossBlue Coupe (Shanghai 2013) and also Taigun (Delhi 2014) concept SUVs. The T-ROC’s design highlights include its striking face with LED headlights, and two removable roof halves. The two-door crossover is said to combine the talents of an all-wheel drive SUV with the “summery airiness” of a convertible. Front and rear cameras extend the driver’s field of vision. The 1,420 kg concept is powered by a 2.0 TDI engine with 184 PS and 380 Nm of torque. The 4.9 l/100 km diesel is paired to a seven-speed DSG and 4Motion AWD. There are three different driving modes – Street, Off-road and Snow – plus Hill Start Assist and Hill Descent Control. 1st glance I thought it was a new Nissan Juke. y it does sound like “Terok”? Next Post: Proton Suprima S six-speed manual spotted in Perak!